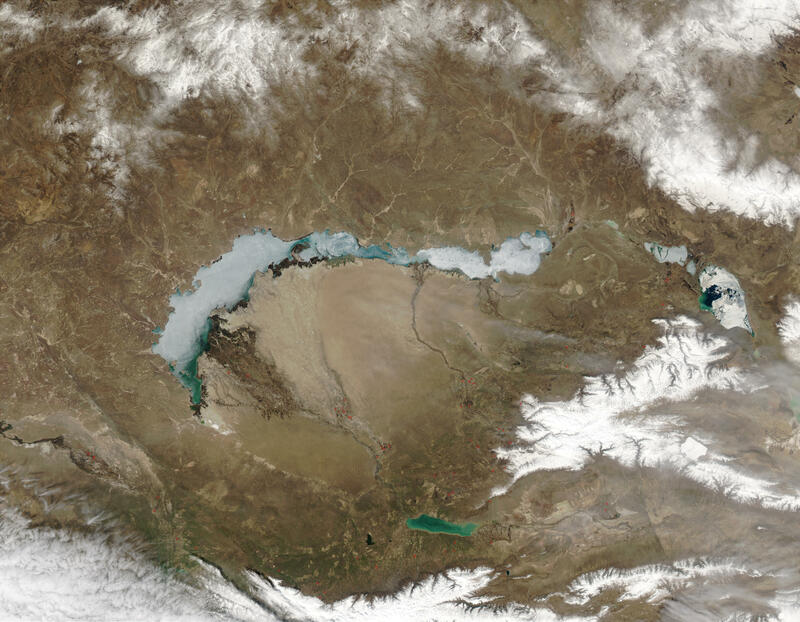 This series of images from the Moderate Resolution Imaging Spectroradiometer (MODIS) on the Terra and Aqua satellites shows the break up and melting of seasonal ice in Lake Balkhash in southeastern Kazakhstan. The crescent-shaped lake is fresh water in the western half and saline in the east. The Ili River feeds the freshwater end, the Karatol flows in east of center, and the Aksu and Lepsy Rivers flow in at the eastern end. 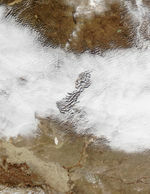 At the lower right of the images are the snow-covered peaks of the foothills of the Tien Shan Mountains. In several images, fires have been detected and are marked with red dots. The series of images runs from early April through May 2003.